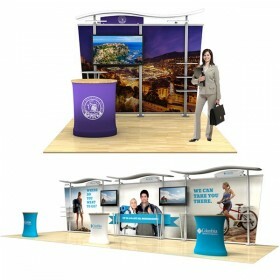 Our signature brands, Promoter™ and AcademyPro™ table top displays, are proudly MADE in the USA exclusively by Affordable Exhibit Displays at our facility in Maine and includes a Lifetime Warranty. 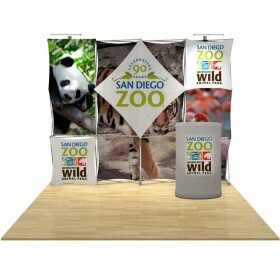 Choose from eco-friendly Premier™ Velcro-receptive fabric, velcro graphic prints or logo header signs. 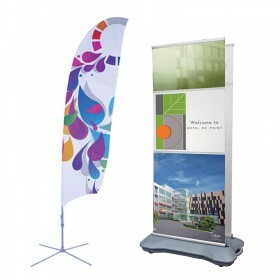 3-Panel AcademyPro Presentation Display Package includes Canvas Carry Bag. 9 standard fabric color choices. 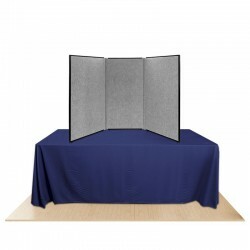 Panel size: 22” x 18" center panel and two 11" x 18" side panels. 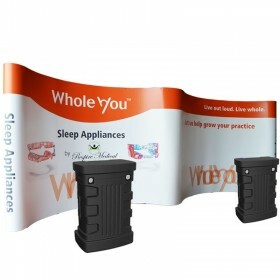 3-Panel AcademyPro Presentation Display Package includes Custom Printed Header, 3 Custom Velcro Graphic Panels & Canvas Carry Bag. 9 standard fabric color choices. 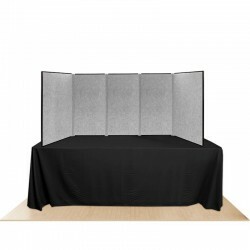 Panel size: 22” x 18" center panel and two 11" x 18" side panels. 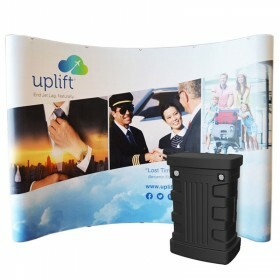 3-Panel AcademyPro Presentation Display Package includes Canvas Carry Bag. 9 standard fabric color choices. 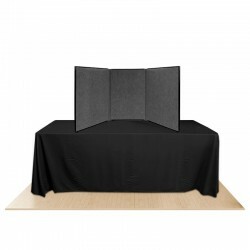 Panel size: 22” x 23" center panel and two 11" x 23" side panels. 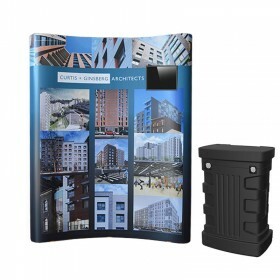 3-Panel AcademyPro Presentation Display Package includes Custom Printed Header, 3 Custom Velcro Graphic Panels & Canvas Carry Bag. 9 standard fabric color choices. 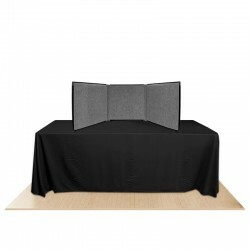 Panel size: 22” x 23" center panel and two 11" x 23" side panels. 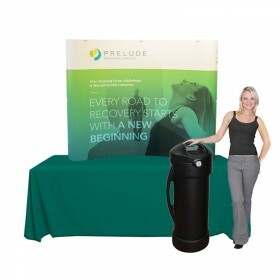 3-Panel AcademyPro Presentation Display Package includes Canvas Carry Bag. 9 standard fabric color choices. 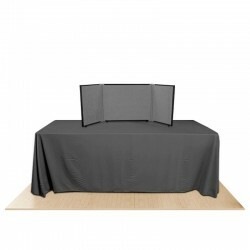 Panel size: 22” x 28" center panel and two 11" x 28" side panels. 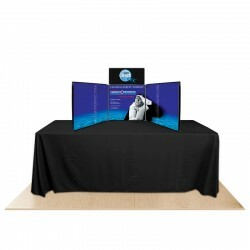 3-Panel AcademyPro Presentation Display Package includes Custom Printed Header, 3 Custom Velcro Graphic Panels & Canvas Carry Bag. 9 standard fabric color choices. 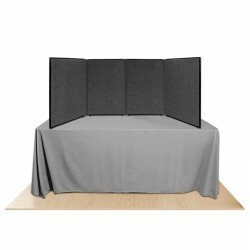 Panel size: 22” x 28" center panel and two 11" x 28" side panels. 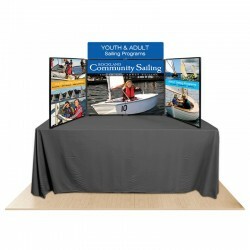 3-Panel AcademyPro Presentation Display Package includes Canvas Carry Bag. 9 standard fabric color choices. 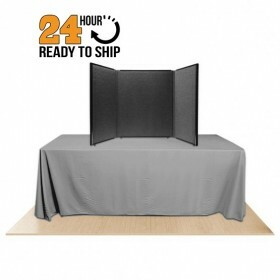 Panel size: 22” x 34" center panel and two 11" x 34" side panels. 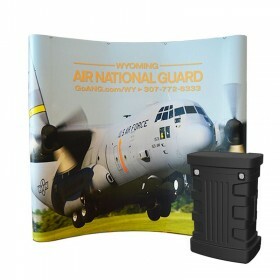 3-Panel AcademyPro Presentation Display Package includes Custom Printed Header, 3 Custom Velcro Graphic Panels & Canvas Carry Bag. 9 standard fabric color choices. 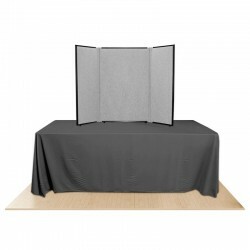 Panel size: 22” x 34" center panel and two 11" x 34" side panels. 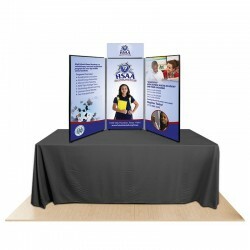 Double sided Promoter24 3-panel table top with velcro receptive fabric panels & canvas carry bag. Choose 2 fabric colors. 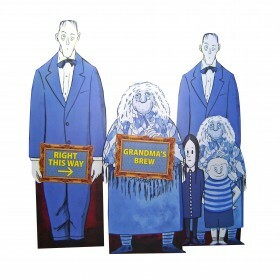 Panel size: 22" wide x 24" tall. 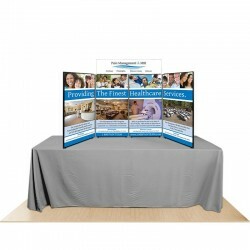 Double sided Promoter24 4-panel table top with velcro receptive fabric panels & canvas carry bag. Choose 2 fabric colors. Panel size: 22" wide x 24" tall. 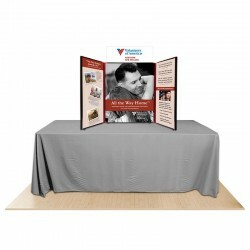 Double sided Promoter24 3-panel table top with velcro receptive fabric panels, Custom velcro mount prints, Custom Printed header & canvas carry bag. Choose 2 fabric colors. Panel size: 18" wide x 24" tall. Double sided Promoter24 4-panel table top with velcro receptive fabric panels, Custom velcro mount prints, Custom Printed header & canvas carry bag. Choose 2 fabric colors. Panel size: 18" wide x 24" tall. 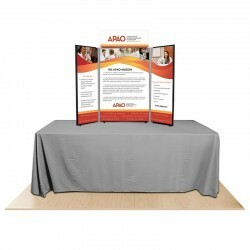 Double sided Promoter36 3-panel table top with velcro receptive fabric panels & canvas carry bag. Choose 2 fabric colors. Panel size: 22" wide x 36" high. 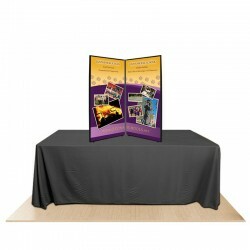 Double sided Promoter36 4-panel table top with velcro receptive fabric panels & canvas carry bag. Choose 2 fabric colors. Panel size: 22" wide x 36" high. 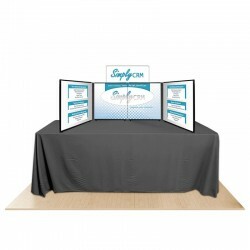 Double sided Promoter36 3-panel table top with velcro receptive fabric panels, Custom Printed Velcro Graphic Panels, Custom Printed Header & canvas carry bag. Choose 2 fabric colors. Panel size: 22" wide x 36" high. Double sided Promoter36 4-panel table top with velcro receptive fabric panels, Custom Printed Velcro Graphic Panels, Custom Printed Header & canvas carry bag. Choose 2 fabric colors. Panel size: 22" wide x 36" high. 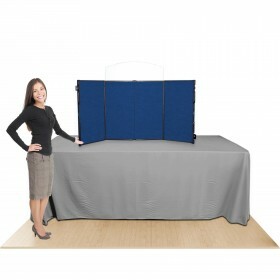 Double sided Promoter45 2-panel table top with velcro receptive fabric panels. Choose 2 fabric colors. Panel size: 22" wide x 45" tall. 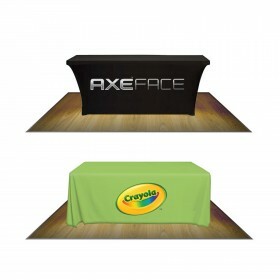 Double sided Promoter45 2-panel table top with Custom Graphic Prints & velcro receptive fabric panels. Choose 2 fabric colors. Panel size: 22" wide x 45" tall. 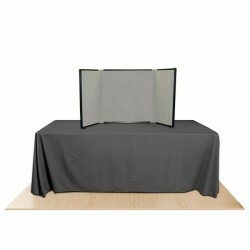 Double sided Promoter45 3-panel table top with velcro receptive fabric panels. Choose 2 fabric colors. Panel size: 22" wide x 45" tall. 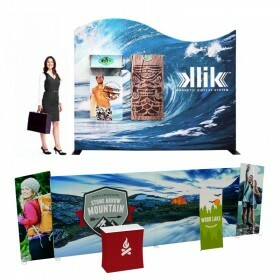 Double sided Promoter45 3-panel table top with Custom Graphic Prints, Custom Printed Header & velcro receptive fabric panels. Choose 2 fabric colors. Panel size: 22" wide x 45" tall. 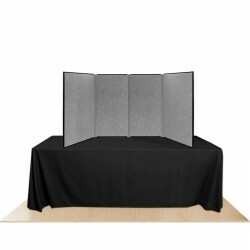 Double sided Promoter45 4-panel table top with velcro receptive fabric panels. Choose 2 fabric colors. Panel size: 22" wide x 45" tall. 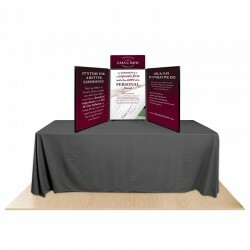 Double sided Promoter45 4-panel table top with Custom Graphic Prints, Custom Printed Header & velcro receptive fabric panels. Choose 2 fabric colors. Panel size: 22" wide x 45" tall. 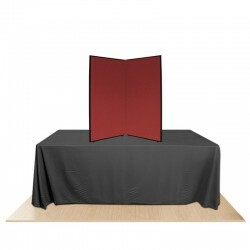 Double sided Promoter45 5-panel table top with velcro receptive fabric panels. Choose 2 fabric colors. 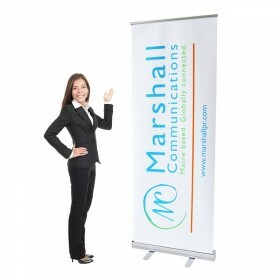 Panel size: 22" wide x 45" tall. 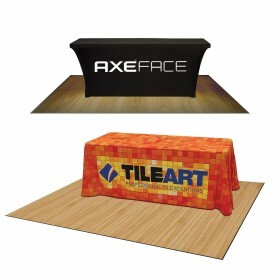 Double sided Promoter45 5-panel table top with Custom Graphic Prints, Custom Printed Header & velcro receptive fabric panels. Choose 2 fabric colors. 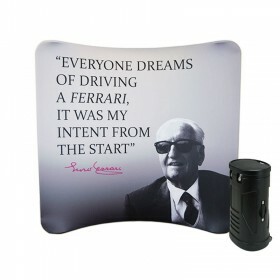 Panel size: 22" wide x 45" tall. 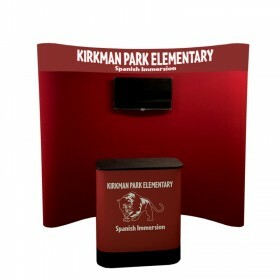 If you're searching for a durable, consistent, reliable panel table top display, you've come to the right place. 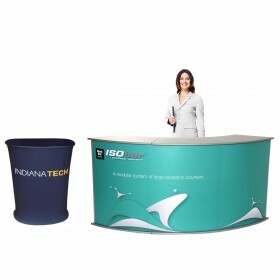 We proud ourselves on having the best selection available to insure your company will stand out from the crowded trade show. 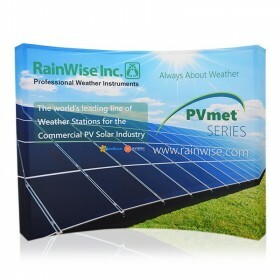 Our most popular series we manufacture is our Promoter® table top display. 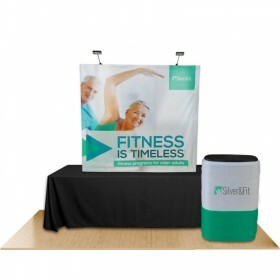 Since 1999, we've been the sole producer of this fabric display providing solid construction along with our exclusive Lifetime manufacturer warranty. 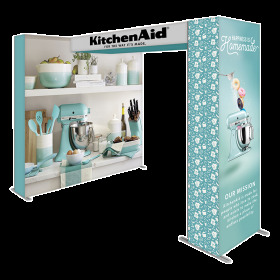 We're so committed to the needs of our customers, we created three different panel heights to accommodate any trade show situation. 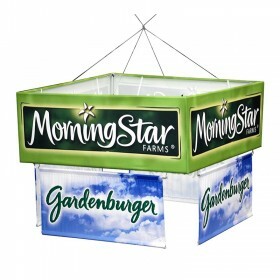 These panel heights include 24" high, 36" high and most popular 45" panel height. 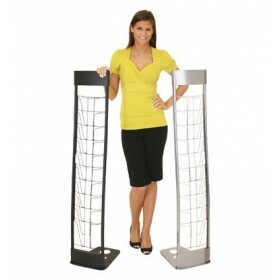 Along with various panel heights, the 24" high and 36" high models are available in either 3 panel or 4 panel styles. 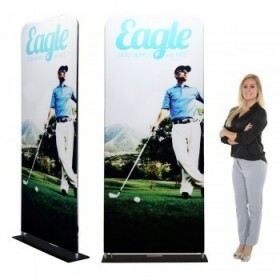 Since the 45" panel height is the most popular model, this is available in 2 panel all the way up to 5 panel styles. 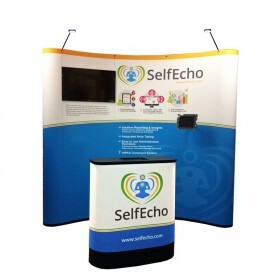 The panel table top display may not have a modern look, but the classic style offers dependability and predictability ever single time, which lessens your stress when setting up at any trade show. 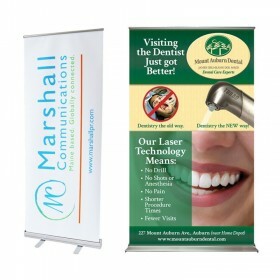 Also working in your favor is the weight of the Promoter® table top display at only 5lbs per panel. 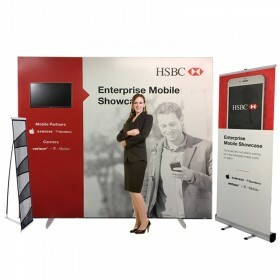 You'll have no trouble transporting this display through various exhibition halls throughout the country. 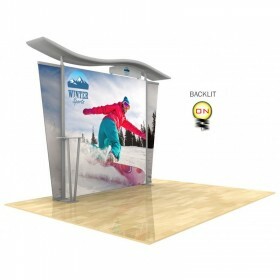 Another leading panel table top display we manufacture is our AcademyPro® Series. 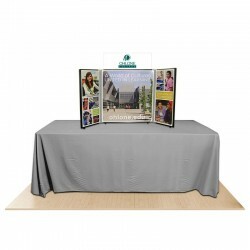 This panel table top display series was specifically created with the restrictions colleges, universities and non profit organizations sometimes face when exhibiting at a trade show. 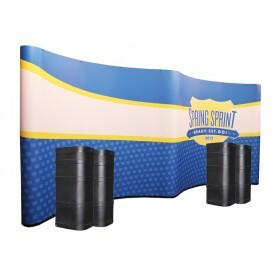 Exclusively produces in Maine, USA and available in 4 popular panel heights including 18” high, 23” high, 28” high and the largest height being 34” high. Providing you with a professional presentation surface, these budget friendly panel table top displays are the perfect option for college fairs, job fairs, quick presentations, specialty meetings or any marketing events. 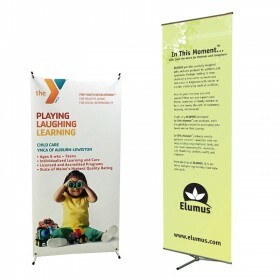 Take advantage of the double sided Premier brand Eco-fabric® Velcro® receptive fabric the Promoter® and AcademyPro® offer. 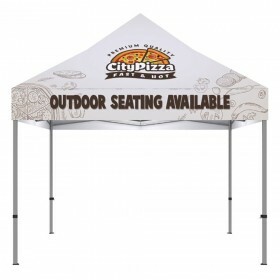 With some options allowing you to choose two different fabric colors, you're in charge of which color you'd like to showcase at every single show. And with 8+ standard Premier brand Eco-fabric® Velcro® receptive fabric colors, there's no shortage of color combinations available. 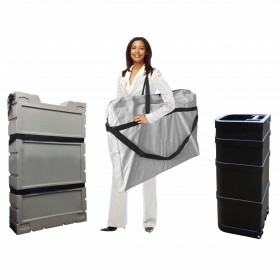 We think the best thing about Premier® brand Eco-fabric® is that it is eco-friendly allowing us to do our part in helping conserve the environment. 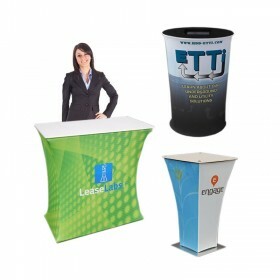 Check out some other products we use this eco-friendly fabric on: 1UP Table Top Pop Ups, Modulum Trade Show Counter, PopUP Oval Trade Show Counter, and the StepUP Triple Tier Product Counter. 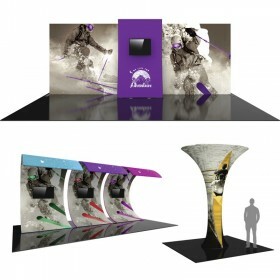 For almost 20 years, the construction of our panel table top displays always comes first. 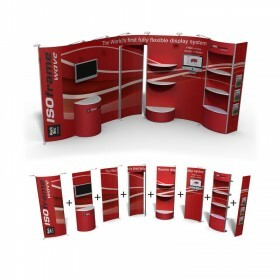 Providing our customers with a long term option for a trade show display is what we keep in mind when choosing the materials for construction. 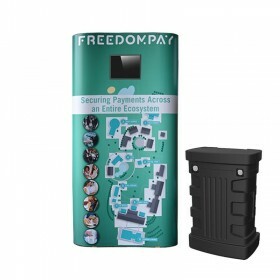 Both the Promoter® and AcademyPro® are manufactured with internal aluminum hinges, durable tri-core fiberboard and protective PVC black trim around the perimeter of each panel. 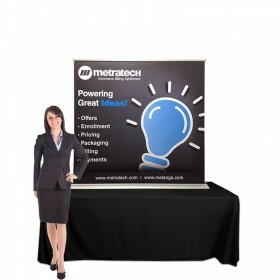 With our name on every one of our panel table top displays, we're confident our longstanding industry expertise will show every time you set-up your trade show display. 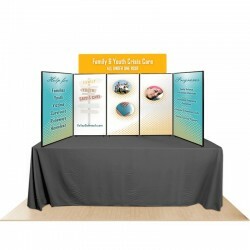 The classic style of these panel table top display allow for maximum versatility at a low cost. 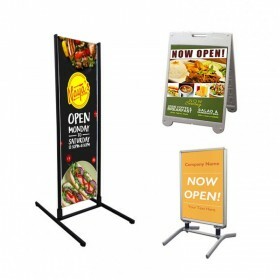 Graphic prints quickly attach to the display with velcro so you can take them on and off with ease or update your message as often as you'd like. 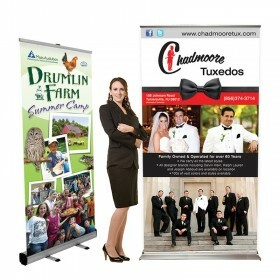 Take advantage of our in-house graphic design to help bring your graphics to the next level! 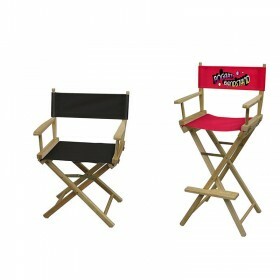 Our quick production time is second to none allowing us to work around your deadline and enhance your marketing presence on a budget. 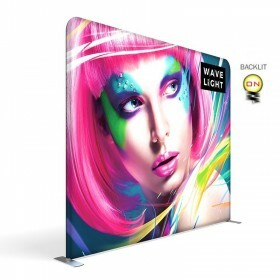 With options such as carry cases or shipping cases, optional velcro graphic panel prints, optional top mount logo sign, you can't go wrong with your panel table top display choice. 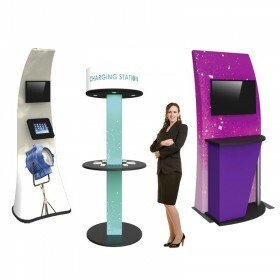 Other than the very effective panel table top displays mentioned above, Affordable Displays manufactures an extensive selection of trade show displays, such as pop up displays, pull up banner stands and trade show podiums. 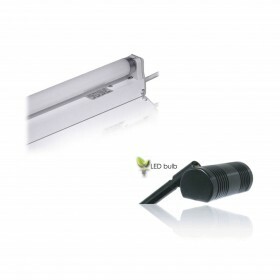 Shop with confidence knowing you can find high quality detailed photos and pricing right here on our website and you can order online anytime that's convenient for you, 24/7. 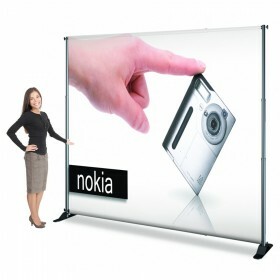 There's no better partner than AffordableDisplays.com when searching for your next trade show display. 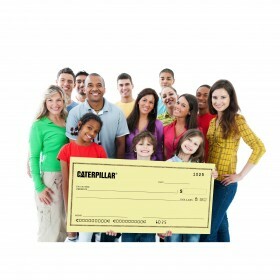 Call us today at 800-723.2050, chat or contact us and let's get started on your project together!